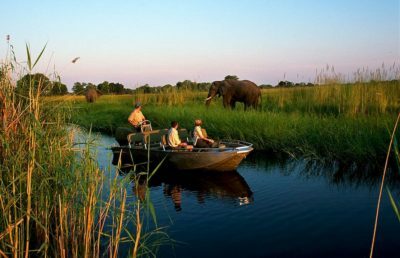 Botswana is about 582 000 square kilometres. This is the size of France, Kenya or the State of Texas in the United States of America. States that share the border with Botswana are Zambia to the North, Namibia to the South West, Zimbabwe to the North East and South Africa to the East and South. According to the 2001 Population and Housing Census the population of Botswana is about 1,8 million. Botswana is a multi-ethnic, multi-cultural and multilingual society. The inhabitants are Tswana, Kalanga, Wayeyi, Hambukushu, Subiya, Ovaherero, Ovambaderu and Afrikaners, Europeans, Asians and Batswana increasingly live in uran areas. At independence in 1966 only 9% of the people lived in urban areas. In 2001 the number had increased to about 54% and is projected to reach 65% in 2011. Many languages are spoken in the country. Setswana is the National language and English is the official language as well as the language of business and commerce. 4.1 The Government of Botswana consists of the Executive headed by the President who is also Head of State, the Judiciary which is under the Chief Justice, the National Assembly led by the Speaker. The Executive includes Cabinet Ministers who are elected Members of Parliament or Specially Elected by Parliament. Regarding The Judiciary is made up of the Magistracy, the High Court, the Industrial Court and the Court of Appeal which is the highest court in the land. 4.2 Parliament has 57 elected Members of Parliament, and additional Four Specially Elected Members of Parliament, the Speaker of the National Assembly and the President of the Republic. There is also Ntlo Ya Dikgosi which is made up of Chiefs from the various Districts of the country. Members of Ntlo Ya Dikgosi advice the Executive on any legislation which affects custom, culture or tradition in their respective areas. Botswana is an upper middle income economy with Gross Domestic Product of about P86,2 billion. The mining (diamonds, gold, copper, nickel, soda ash and coal) sector has a dominant role. However tourism, banking and services, construction, manufacturing and government have an important contribution measure to economic growth. The national current, the Pula, is a relatively stable currency.